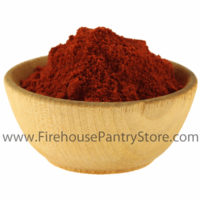 The unique flavor of Smoked Paprika is created by drying Pimento pepper in an oak wood oven. Paprika adds flavor and color to a multitude of dishes and dry rubs. Ingredients: smoked Spanish paprika. Packaged in a facility that packages wheat, milk, soy, egg, peanuts, and tree nuts.